A healthy diet can help manage conditions that cause an enlarged thyroid gland, also called a goiter. These include hyperthyroidism, or an overactive thyroid, and hypothyroidism, when your thyroid is underactive. Eating certain foods and avoiding others may also help reduce bothersome symptoms, such as coughing, pressure in your throat, hoarseness and difficulty swallowing. Because foods affect people's thyroid symptoms and medications differently, seek guidance from your doctor before making any significant dietary changes. Vegetables contribute rich amounts of antioxidants that lower inflammation and help your body resist and heal from infections and disease. While eating anti-inflammatory foods when you have a goiter is important, certain vegetables may exacerbate your condition. Cruciferous vegetables, such as broccoli, cauliflower, mustard greens and kale, release goitrogens -- substances that may disrupt thyroid function -- making your symptoms worse. Cooking these veggies, which reduces their goitrogenic properties, and choosing other vegetables more often can help keep your symptoms from worsening. Cooking also softens vegetables' texture, making them easier to swallow. Nutritious, nongoitrogenic vegetables to emphasize in your diet include bell peppers, string beans, asparagus, sweet potatoes and mushrooms. The minerals iodine and zinc play an important role in thyroid function. Although thyroid disease is the main cause of goiters in the United States, iodine deficiency is the leading cause worldwide, writes registered dietitian Cheryl Harris in an article for "Today's Dietitian." 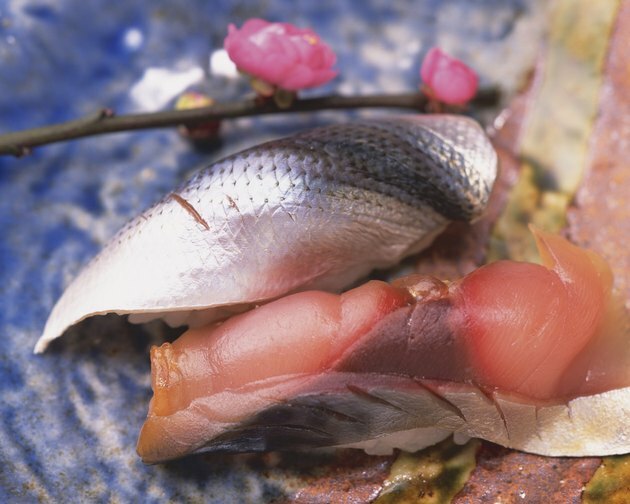 Fish provide valuable amounts of iodine, zinc and omega-3 fatty acids. Omega-3s are essential fats that reduce inflammation. To guard against swelling in your throat and elsewhere in your body, replace inflammatory protein sources, such as red and processed meats, with oily fish, such as salmon, mackerel and herring. As valuable vitamin D sources, fish can also help prevent or reduce vitamin D deficiency, which can contribute to hypothyroidism. Unlike refined grains, whole grains aren't stripped of valuable nutrient content during processing. As a result, they provide more micronutrients, including B vitamins and selenium. Selenium is stored in the thyroid gland and plays a crucial role in its function. Eating more vitamin B-rich foods may help reduce symptoms of thyroid disease, according to the University of Maryland Medical Center. Replace refined-grain products, such as instant rice, white bread and low-fiber cereals, with nutritious, whole-grain alternatives, such as wild rice, quinoa and oatmeal. Make sure whole grains are listed as main ingredients in your breads, pastas and cereals. If you have difficulty swallowing, choose soft whole-grain breads, pastas and cereals -- such as oatmeal instead of whole-grain cold cereal. Beans and lentils provide nutritious protein alternatives to fatty meats as well as rich amounts of fiber, which supports digestive function and appetite control. Fiber-rich foods are particularly important if you have hypothyroidism, which can cause undesirable weight gain and constipation. Legumes are also among the top sources of iron, which may help minimize symptoms of thyroid disease. Because iron supplements may interact with thyroid medications, food sources are a safer bet, according to UMMC. Pair beans and lentils with vitamin C-rich foods, such as bell peppers and citrus fruits, for improved absorption. Add chopped bell pepper to lentil soup, for example, or serve mild vegetarian chili with orange slices. Can Certain Foods Heal Inflamed Intestines?